Finally! 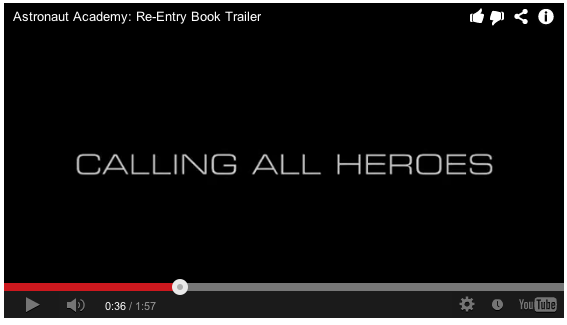 The official book trailer for Astronaut Academy: Re-Entry is here! Special Request! Please go to Youtube and give this video a thumbs up + positive comment about the trailer and/or the book. Encourage people to read Astronaut Academy! On May 14th, I will choose 3 lucky commenters at random and they will win a signed copy of my book Teen Boat! Seriously! As extra thanks I’m posting the epilogue just for you guys HERE! Over the next few days I’ll post some fan art and guest comics (if anyone is interested in drawing one) here at AstronautAcademy.com and I hope you’ll continue to check out my blog at Yaytime.com for news and updates on my future books! And of course all reviews posted on Goodreads and other sites are super appreciated! To my fans: I couldn’t do this without YOU! Let’s team up in the future, and save the world! Are we allowed to have multiple entries to Astronaut Academy day? I just realized something… Tyke has a Keyblade on his shirt. Also, there’s an asterisk next to Miyumi’s dog’s bark, but there’s no translation! Did I skip over the translation or something? I just got the actual book and the asterisk has been removed. Best series ever known to man!!!!!!!!!!!!!!!!!!!!!!!!!!!!!!!!!!!!!!!!!!!!!!!!!!!!!!!!!!!!!!!!!!!!!!!!!!!!!!!!!!!!!!!!!!!!!!!!!!!!!!!!!!!!!!!!!!!!!!!!!!!!!!!!!!!!!!!!!!!!!!!!!!!!!!!!!!!!!!!!!!!!!!!!! !